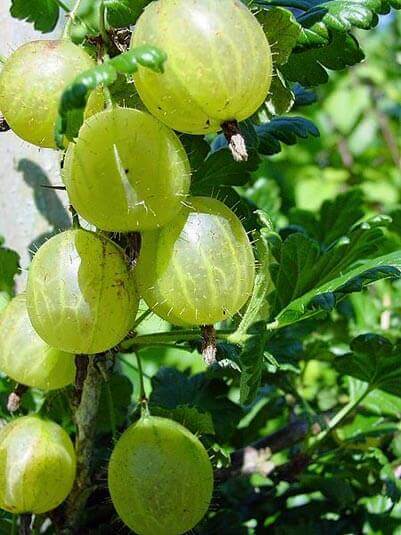 The gooseberry is a straggling bush growing to 1-3 metres (3-10 feet) tall, the branches being thickly set with sharp spines, standing out singly or in diverging tufts of two or three from the bases of the short spurs or lateral leaf shoots. The bell-shaped flowers are produced, singly or in pairs, from the groups of rounded, deeply-crenated 3 or 5 lobed leaves. The fruit of wild gooseberries is smaller than in the cultivated varieties, but is often of good flavour; it is generally hairy and the colour is usually green, but there are red variants and occasionally deep purple berries occur.